Coleraine are facing potentially eight cup finals as they bid to make it a very memorable climax to a season. The Bannsiders have six league games left to play along with an Irish Cup semi final, and possibly the final, and excitement is building on the Ballycastle Road. 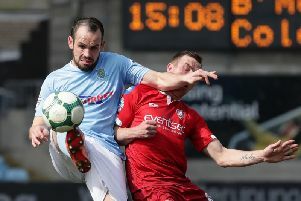 Champions-elect Crusaders visit The Showgrounds this Saturday in the final game before the league split, and Oran kearney is relishing the intensity of the run in with a trophy and European football in his sights. “Our final three games before the split were against top six sides and then the final five are the same. It’s tough, but brilliant,” said the Bannsiders boss. Coleraine moved up to third in the table following their win at Glenavon last Saturday. And they strengthened their position with a 1-1 draw at rivals Ballymena United in mid-week. But Kearney knows league positions only matter come the end of the season. “It was by no means one for the purist last Saturday,” he said. “It was similar to last week as it was never nailed on until the final whistle. “I was delighted to have picked up the three points and to have produced a decent performance. “We followed that up with another decent performance against Ballymena on Tuesday night. “I would have happily picked Ballymena’s pockets and moved on but I think a draw was fair. “We didn’t make life easy for ourselves in the second half - I’ve seen us play smarter at 1-0 up. “We’re into third now, but I said to the lads it’s not about being third with six games to go it’s about being there at the end of the season. “We’ve caught up serious ground on Cliftonville, but we’re only two points ahead so we won’t be resting on our laurels or slapping each other’s backs now. Coleraine know their long unbeaten run will come under some serious scrutiny from the Crues on Saturday. They showed they aren’t about to let their grip on a hat-trick of league titles slip just yet with an impressive comeback win over Ballinamallard United on Monday night. “Questions were asked of us with different people putting pressure on after Linfield cut the gap to four points at the weekend. I think we answered those questions really well,” said Stephen Baxter. Paul Heatley scored two Goal of the Season contenders against the Mallards much to Baxter’s delight. “His two goals were of different quality, they were worth the admission alone,” he said.